There are unleashed talents waiting to sprout, tired rainmakers who are striving for an opportunity to start their own ventures and there are some truly enlighten souls who believe they have something more to offer in this world. If you aspire to own your competitive advantage, challenge the conventional thinking and be a part of revolution and want to be a trailblazer in the Information Technology and Management field, look no further than Information Technology Entrepreneurship and Leadership Forum (iT ELF) at SCIT. We provide an opportunity to discover and nurture the entrepreneurial spirits. SCIT is known for creating global IT professionals who are trained to be leaders and unleash their entrepreneurial spirit. iT ELF is an endeavor of SCIT that works as a catalyst for nurturing entrepreneurial talents; it is also a resource centre creating awareness relating to entrepreneurship and leadership in education and also providing direction relating to entrepreneurship development and management. Yesterday I was sent for a workshop by NEN to MIT Pune with two of my colleagues. We were there to learn something about E Cell [Entrepreneurship Cell]. We had formed such a forum in our college by the name of iT ELF [information Technology Entrepreneurship and Leadership Forum] which apart from entrepreneurship also focuses on developing leadership qualities. The workshop was to train 2 to 3 members form E cell of 31 campuses present there to understand the functioning of an E cell and how to go about it. The workshop was conducted by Mr. Vinod Shashtri. Mr. Mandar and Miss Yoshima. It was a total practical approach to make us understand how to go about it. We started off with registration and a few basics about E-Cell or for that matter any committee or forum on campus. we proceeded through creating a two year plan for our iT ELF, segregating activities in different types and then evaluating what all we have done and what is left to be done. Basically it all was about the three stages- Awareness, Intermediate Knowledge and Regularizing the activities and finally Institutionalizing it. It was a great experience and we cant wait to impart our learning to our fellow members of iT ELF and implement what we have learned. 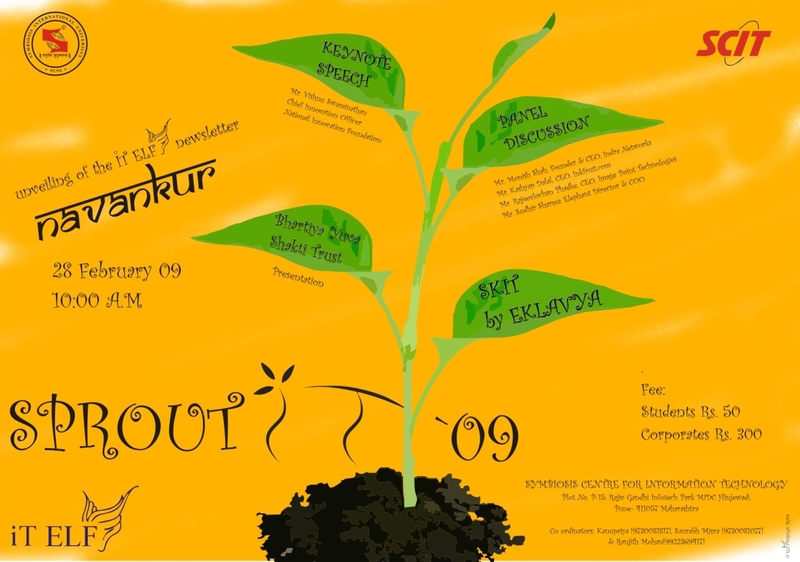 Sprout IT 09: SCIT Entrepreenurship Cell Launch. If you aspire to own your competitive advantage, challenge the conventional thinking and be a part of revolution and want to be a trailblazer in the Information Technology and Management field, look no further than Information Technology Entrepreneurship and Leadership Forum (ITELF) at SCIT. We provide an opportunity to discover and nurture the entrepreneurial spirits. SCIT is known for creating global IT professionals who are trained to be leaders and unleash their entrepreneurial spirit. ITELF is an endeavor of SCIT that works as a catalyst for nurturing entrepreneurial talents; it is also a resource centre creating awareness relating to entrepreneurship and leadership in education and also providing direction relating to entrepreneurship development and management. We welcome the alliances with government department, industry, professional bodies like NASSCOM, the national entrepreneurship network, The Indus Entrepreneurs (TiE), Academia world and other independent entrepreneurs. Queries and expression of interests can be sent at itelf@scit.edu. Saurabh Mishra , Kanupriya Kejriwal  and Ranjeet Mohan . January 16, 2009… Attended the classes whole day long and then a meeting with ITELF [Information Technology Entrepreneurship and leadership Forum] till 0030 hrs and then had to goto POC lab to help out a friend as they had some issues with the setup. In tha lab was reminded that I had to be there at IdeaCamp at SICSR the next day and for that I had to leave by 0715 bus as I was one of the unorganizers. I thought that i might skip this time [my very first time] but left the decision to be taken in the morning. Left the lab at 0230 and still was not sure to go or not. Went to my hostel and slept the moment I fell on bed. Dont know how I woke up at 0700 and then got ready just in time to catch the 0715 bus and was at the venue after 30 minutes or so… had to waut there till 0930 for others to arrive. Then on it was just fun meeting with peeople and getting to know them and their ideas. People came up with cool ideas as Idea Framework which talked about how to develop an Idea and then there was a presentation by PlanetAikon who provides a platform for the ideas to be developed into products. There were various ideas for the community benifit like Disaster management, Green bags, Green IT, Community Wireless Networks and Service on Mobiles. There was a unique idea by Navin Kabra [ a pune technologist ] about Pune blogs. My overall experince at Ideacamp was very good. Being an organizer is a nice job and guess from now on I wud always be wanting to be a part of the organizing team. It allowed me to meet many different personalities who have immense experience in their doamin as well as life and it is these people who stand by students or newbies like us to guide our way when we are totally clueless what to do next.